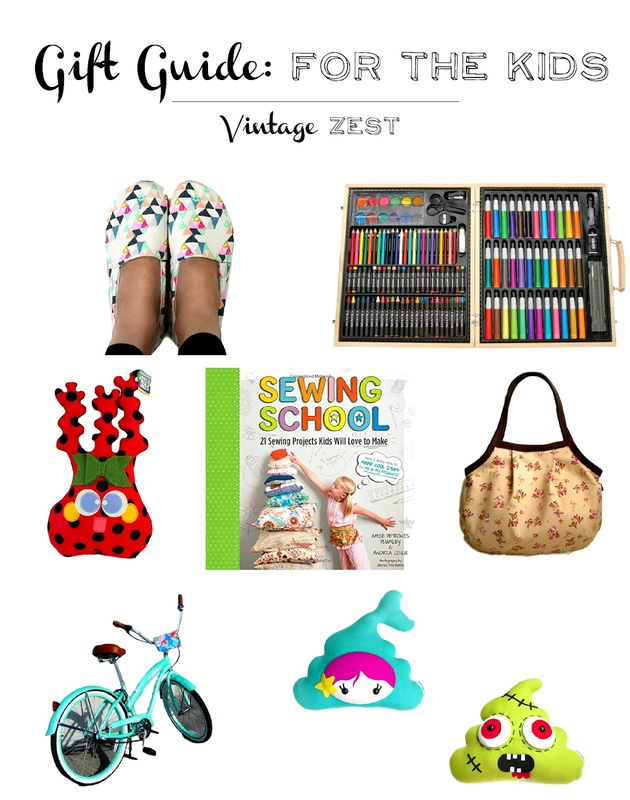 Gift Guide for the Kids ~ Diane's Vintage Zest! So many of my family and friends are having kids recently, that I am constantly on the lookout for a gift for children of all ages. You know me, I have to gift something completely unique and special, that no one else knows about. Lucky for you, today I have curated a collection of amazing gifts that will be your little one's favorite present in the bunch! 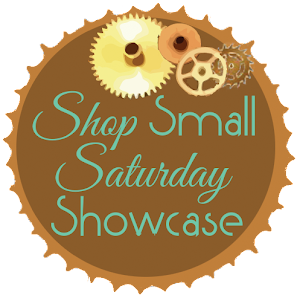 Once again, it includes many of my favorites from Shop Small Saturday and some upcoming features as well! Let's get to the guide! Pink Floral & Red Plaid Shoes from ClamFeet, $26.50 : Get those tiny tootsies covered in style! Donut Bows from Bownuts Cafe, $8 : Donut& candy-themed bows? Adorbz! Tank Dress from Santore Company, $35 : I'm so getting this for all my California girls! Bows, Bows, Bows & more bows! 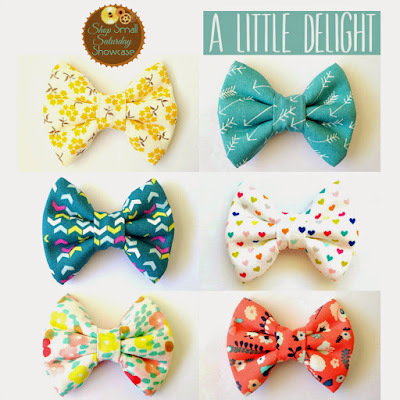 from A Little Delight, $8 : SO many fabric options for these bows and bow ties! Agnes the Dimetrodon & Charlemagne the Unicorn from Squshies, $32 & $28 : Two of the fun and fanciful felt creatures from Squshies. Find your favorite in their cute collection! Little Frog Prince & Angora and Cashmere Rabbit from Zazu Faure, $32 & $26 : Classic plush animals using upcycled materials! Felt Fruit Set from Noshkins, $45 : "Hey kids, it's time to play with your food!" This darling fruit set is fun, or you can go with a sushi set, sandwich, petit fours... Yum! Peek a Boo Print, Woodland Creatures from Hello Maupoo, $15 : A sweet little design for the nursery! Triangle print shoes from ClamFeet, $36.50 : It's a part of the "Mommy & Me" set, but they're so darn cute, I want a pair for myself! 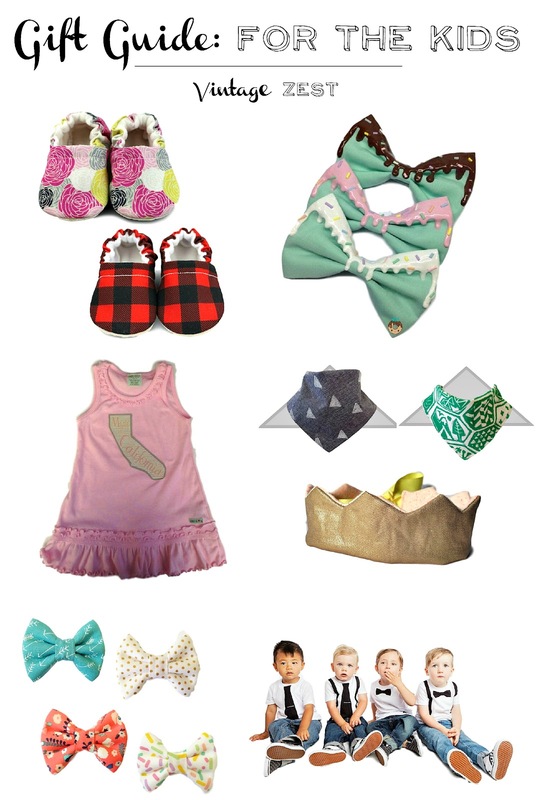 The triangle print is probably my favorite... but there are oh so many choices! Darice ArtyFacts Portable Art Studio, $16.49 : Are there ever enough art supplies with the little ones around? Plush Felt Monster from FeltFlanerie, $110 : So quirky and cute! I love all of FeltFlanerie's creations, like this giant monster. If you want something smaller, check out her other adorable items too! Sewing School: 21 Sewing Projects Kids Will Love to Make, $10.17 : My niece might be getting this book... so shhh! Reindeer tote bag from 520 Handmade Creations, $25 : Another present for my niece? She'll LOVE this! Convertible Bike Clutch from Point A 2 Point B Designs, $19.95 : Give the kids a place to stash their favorite items on the go! I hope you found a few gifts to add to your list and bookmarked a few new favorite shops as well! Gift Guide For Everyone: Neighbors, Coworkers, and More! 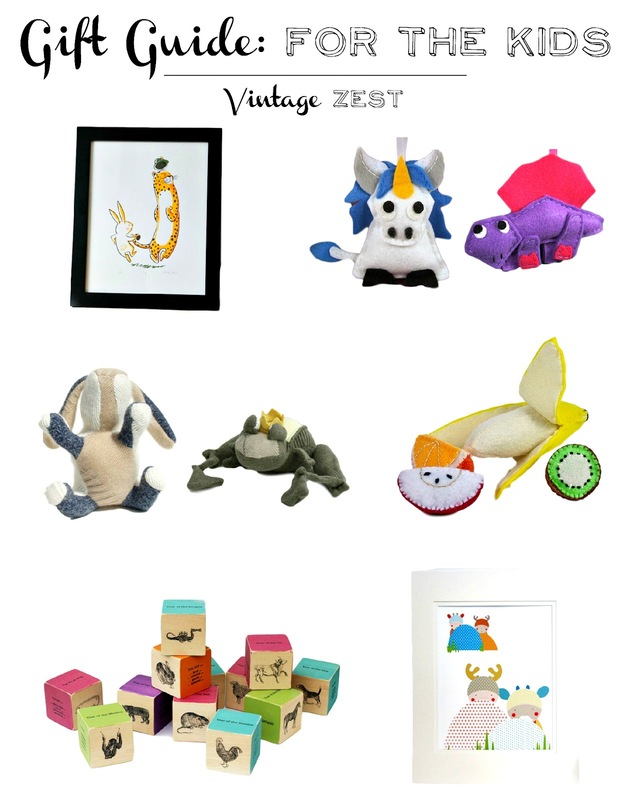 This post contains affiliate links, meaning that if you make a purchase using one of the links, a small commission will go to support Vintage Zest. I will only recommend sites with products that I think you will love and enjoy!